MY E.G. Services Berhad (“MYEG”) is a concessionaire for Malaysian Electronic-Government (“E-Government”) MSC Flagship Application. 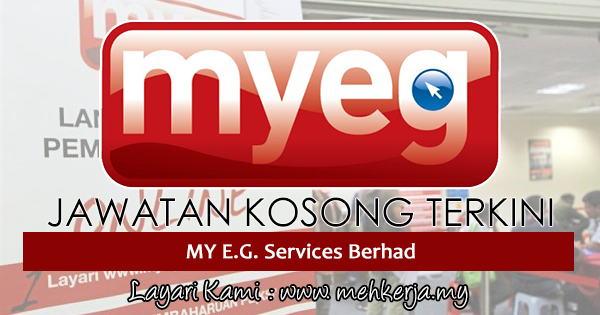 MYEG builds, operates and owns the electronic channel to deliver services from various Government agencies to Malaysia citizens and businesses. First wave of solutions deployed in our early years (2000 to 2010) were for the Government to Citizen (“G2C”) and Government/Enterprise Solution (“GES”) business categories. Over the past 5 years MYEG has invested in and is currently deploying our next generation technologies based on The Internet of Things (“IoT”) solutions. We believe that the deployment of IoT coupled with big data analytics will bring significant improvements to our overall quality of life. Our environment will increasingly anticipate our needs as opposed to responding to our actions. 0 Response to "Jawatan Kosong Terkini di MY E.G. Services Berhad - 12 September 2018"